New York Jets vs. Arizona Cardinals NFL Free Picks & Football Predictions, Monday October 17 2016 at 8:30 PM EST. Watch it live on ESPN from University of Phoenix Stadium. The New York Jets have started the season in a very disappointing fashion, going 1-4 both straight up and ATS. 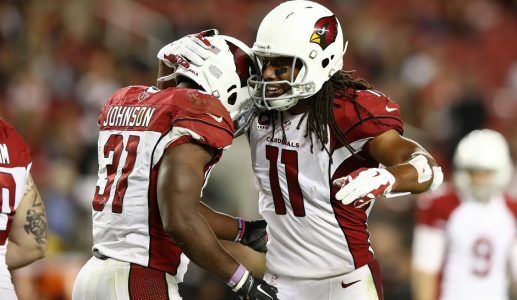 They travel to Arizona to take on the 2-3 (SU & ATS) Arizona Cardinals Monday night, a team that can’t be happy about already matching its season total of losses from a season ago. The majority of the tickets, close to 60 percent, are coming in on the Cardinals but the sports books both online and in Vegas are holding on to the opening line of Arizona -7.5. The wagers are coming in close to dead even on the game to go over/under the total. The Jets closed as a 10-point dog and were completely outclassed during a 31-13 road loss at Pittsburgh last week, their third consecutive defeat. They’ve scored just a grand total of 33 points during the losing streak and quarterback Ryan Fitzpatrick has been picked off nine times. The Jets have struggled to establish a running game as well and now they’ll come up against one of the most talented defensive units in the league. The Jets have failed to cover the spread in each of their four losses this season. The Cardinals halted a two-game losing streak with a 33-21 victory as a 3.5-point favorite at San Francisco on Thursday Night Football in Week 5. Drew Stanton stepped in admirably for Carson Palmer behind center in that contest, but Palmer has been practicing in full after clearing the league’s concussion protocol and will be available for this contest. Palmer is however off to a slow start with six touchdowns and five interceptions through his four starts. What Arizona does have is a red hot standout running back in David Johnson, who carried the ball for 157 yards and a pair of scores at San Francisco. New York’ D ranks No. 2 against the run at 68.4 yards per game but its surrendering 303.0 yards per game through the air. The teams have not faced each other since 2012 when the Jets won 7-6 in New York. Jets are 4-1-1 ATS vs. a team with a losing record. Jets are 1-3-1 ATS in their last 5 road games. Jets are 1-5 ATS in their last 6 games following a straight up loss of more than 14 points. Cardinals are 20-7 ATS vs. a team with a losing record. Cardinals are 2-8 ATS in their last 10 home games. Cardinals are 1-4 ATS in their last 5 games after scoring more than 30 points in their previous game. Under is 5-1 in Jets last 6 road games. Under is 6-2 in Jets last 8 Monday games. Under is 7-0 in Cardinals last 7 home games. Both teams are struggling to move the chains and Arizona’s D should step up big time here on prime time. The Cardinals may struggle to cover a touchdown-plus though so go with the under.